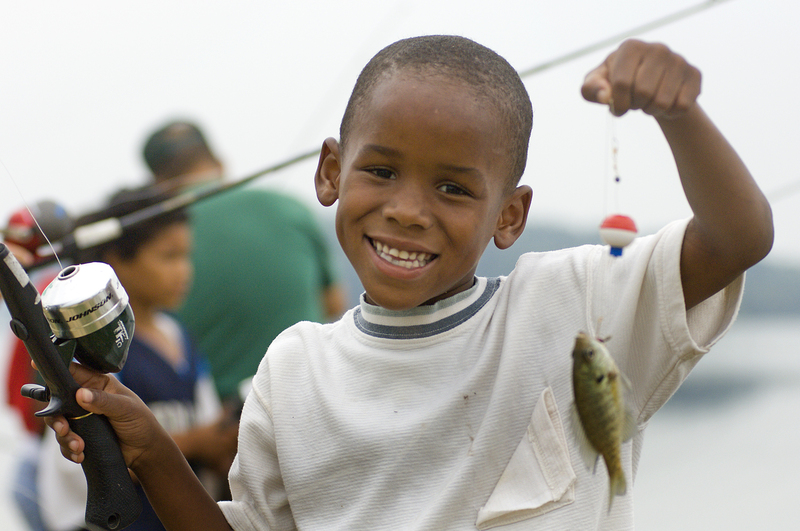 Family-friendly fishing sites will allow parents and children to get out and enjoy fishing. Photo: Dave Kenyon, MDNR. Experienced anglers may know the difference between good places and bad to fish, difficult places and those that are easy, but families just starting often do not. And so, many never fish. The learning curve sometimes seems too steep. But state officials say they hope that will change this year. Michigan Department of Natural Resources fisheries staffers are developing a Family-friendly Fishing Waters website they plan to launch in April, the start of the 2013 fishing season. The decision to develop a family-friendly website, one that lays out the fish that can be caught, how to get there, and other amenities like bathrooms, parking and where to fish, came out of research into what other state were doing. Michigan was found to be behind the times, according to Dexter. “We found that there is a whole lot of this around the country and we seemed to have missed the train,” Dexter said. “That was unsettling to me. Dennis Eade, executive director for the Michigan Steelhead and Salmon Fisherman’s Association, said the initiative is timely and necessary. Having a website that lets families know where to fish is important. “This has been on every (Steelheaders) chapter agenda for the last two years,” Eade said. “This is terrific and something we can really get behind. Amy Trotter, the resource policy manager for Michigan United Conservation Clubs said she plans to invite MUCC members to submit their suggestions and hopes the program doesn’t prove financially “onerous” for the DNR. Early efforts to gather family-friendly fishing sites proved only modestly successful, according to Dexter. Creel clerks were asked for suggestions as well as angling groups. Some sites were good, but many not so – at least not for families and inexperienced anglers. The plan, according to Dexter, is to list family friendly sites in every county where there are good fishing waters. To date, there are 40 vetted sites. Examples can be found on the DNR website. Click on fishing in the left column, then Family Friendly Fishing Waters. Fisheries staffers are now asking the public for site suggestions. Those can be submitted on that page. The Family Friendly Fishing Waters idea grew out of the initiatives launched by former DNR director, Rodney Stokes, according to Dexter. Stokes’ focus was improving customer satisfaction and making the agency more user-friendly. The new program is being developed to provide an easy way for families and young prospective anglers to get involved; something agency officials say is needed to maintain fishing license sales in the future while providing an opportunity for quality family time outdoors today. “My hope is that we get more people interested in trying to fish for the first time and introduce those who wanted to but didn’t by removing some of the hurdles involved with breaking into it,” Dexter said. This entry was posted in Uncategorized and tagged DNR, Family Friendly Fishing, Fisherman, Fishing, Michigan Department of Natural Resources, Michigan Steelheaders, MUCC. Bookmark the permalink.